Technology is changing everything these days. It’s changing the way we communicate with each other, it’s changing the way we shop, and it’s definitely changing the way customers interact with their auto dealer’s service department. Your customer is the key to your business, and customer satisfaction should be the primary goal of your auto dealership, especially in this hyper-connected world we live in. Therefore, applying technology to keep them informed and updated on a high-ticket item like their vehicle is a valuable asset, not only to them but also for your dealership. Every service advisor of an auto dealership knows this. The service department is where the dealership makes the bulk of its top line revenue, and they drive this revenue through repair orders (ROs). Repair orders allow you to process the service department’s transactions such as scheduling, repair services and labor cost. Through technological advances such as text messaging and automation, customers and service providers can communicate directly, which makes the old way of having your vehicle repaired a thing of the past. Using text messaging as a form of communication with your customer, you’re now able to automate follow-ups, properly manage employee hours spent communicating, better control inventory, and most importantly have a more open and efficient relationship with your customer. A better relationship with your customers is a direct gateway to more repair orders for your dealership, and in return a major increase in revenue generated through your service department. Customers are now able to track their vehicle maintenance in real-time. They can track their service request, vehicle service status, warranty on parts, and their billing process. They can set appointments via text directly with their service advisor and get reminders directly to their phones through text. Through transparency, customers now feel empowered. They feel empowered to troubleshoot and fix vehicle issues and figure out the correct decision whether or not to have their vehicle repaired or serviced. Through text and multi-media such as pictures, videos and sound, the customer is empowered to make the right decision whether their vehicle needs the recommended repairs, faster, and more efficiently. Customers always have questions about their vehicle and service. Text messaging communications and automation during a Repair Order allows them to get detailed answers in real-time, so that they can feel comfortable with the process. No longer does the customer have to wonder when and if they need servicing. This automated system alerts the customer when service is needed. Either initiated by a service advisor, or through automated avenues such as a dealership's DMS or BDC. Managing inventory can be a headache. Now customers have access to ordering the parts and accessories they need for their vehicle faster than ever before. Status updates on parts & accessories, and even payment can be automated through text & mobile bill payment. Customers can now become educated on various different products and the top brands within specific categories for their vehicles. Once the customer is educated on the various products, they are able to order and track these products on the system via text. The customer no longer has to wait in long lines as was the case in the past. The process is now streamlined, so lines are shortened, and transactions are now faster. The customer can now review the invoice via text, when it is convenient for them, and pay online without ever reaching the dealership’s cashier. No more surprises at the time of pick-up. All these added benefits lead to added convenience for the consumer. Value to the customer is amplified because servicing their vehicle is no longer an all-day outing. Text messaging is the superior, preferred form of communication. This system creates a community where customers can share ideas, service reviews and get valid feedback from their service providers. Dealerships are also now able to send specialized messages to their customers such as happy birthday and vehicle anniversary messages, keeping the relationship between them solid. When it comes down to the basic value of text messaging during and after a customer’s repair order completion, it’s all about customer feedback. Based on the feedback from customers you’ll be able to better inform and assist your existing customers as well as future customers. Not to mention a proven tactic to increase your dealership’s CSI Score. Integrated vehicle monitoring allows service departments to deliver Vehicle Health Reports directly to the customer via text in instances where the vehicle is in need of service. Instances such as an oil change need, check engine light and low surface area on tires. This communication is “two-way” and opens the door to better customer satisfaction and retention. Which in turn leads to an increase in Repair Orders for the dealership. Recalls are important for the safety of your customers. Notifying them about recalls via mail is a thing of the past. Now, customers can now be notified of service recalls straightforwardly from their vehicle service department via text messaging and automation. This is a much-added benefit to your customer and gets more people in the door to have their manufacturer’s safety recalls performed at your dealership. Speed CheckOut™ is a great way to decrease the time taken to clarify charges on someone’s bill before they even get to the register to pay. The customer is alerted via text message and is able to pay the bill directly from their phone. Completely streamlining the vehicle’s pick-up process in your service department. Less time spent at the time of vehicle pick-up, means more time to get more done for your service department and the customer. Specialized text messaging website integrations can improve customer satisfaction. Offering coupons text directly to loyal customers from your current website can get your parts and accessories off the shelf, as well as book more service appointments. Live chat and texting for a service appointment is also another vital website integration for your customers. Who wouldn’t like to text with their service department to book an appointment, find out about service specials, parts discounts and other important information? Offering these integrations adds tremendous value, guarantees high customer satisfaction, and books more service appointments. The writing is on the wall. Text communication and automation is a valuable resource to have, not only you, but also for your customers. If implemented correctly, the value is enormous for both customer satisfaction and service department revenue. Technology is changing the service landscape. Don’t get left behind, wishing you were up-to-date with the fastest, most efficient form of communication. Make the change today! 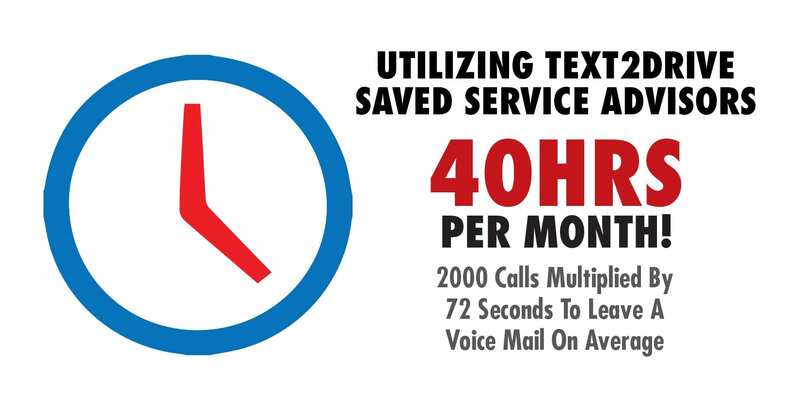 TEXT2DRIVE™ is the leader in text-based, two-way communication for the auto industry. Our text messaging, marketing and sales software streamlines your service department’s efficiency and effectively all under one hood. It will save thousands of man-hours through standardizing and automating text communication efforts. Don’t take our word for it; take a look at our testimonials and case studies all over our website from actual dealerships, services advisors, dealership owners, and sales managers. Today, lack of communication is no longer an excuse for not giving your customers the proper attention that they need. If you’re experiencing pain points that can be easily prevented through open communication within your organization, then consider implementing the TEXT2DRIVE™ text messaging platform.